The Apples to Apples card game is great group/party game. 10 people can play! And we've found the more people the better. It's a simple concept, but a great card game. We're playing it all the time: before we head for the theatre, while dinner is in the oven, or just whenever there's a spare half hour and a lot of people who want to have fun. Our group especially likes to debate/cajole/heckle the judge as s/he makes the choices. Hours and hours of laughter. The Apples to Apples card game definitely has the best fun/dollar ratio of any game in our cabinet. The gameplay of the Apples to Apples card game is simple and fast. Each turn, one player is the judge. First the judge deals out enough cards to bring everyone up to 7 cards. These "red apple" cards are objects or concepts, for example "A Sunset", "Black Velvet", or "Picking Your Nose". The judge then takes one "green apple" or adjective card and plays it face up. Examples are "Peaceful", "Happy", or "Contemptuous". The players quickly put the red apple card they think best matches the adjective face down on the table. Gotta be fast though, because the last card down isn't included in the round. The judge chooses the card that IN THIER OPINION best matches the adjective. Which card is closer to "Peaceful": "A Sunset" or "Picking Your Nose"? The judge awards the green apple card to the player who gave the best match. The next player then becomes the judge and the turns keep going until one player collects enough green apple cards to be crowned the winner. Who should buy Apples to Apples? The Apples to Apples card game will appeal to anyone who has a group of people. Apples to Apples is a big hit with families because kids can join in on the fun. Some of our funniest moments ever have come from the matches that children make. And our crew of 30 year-olds loves it too. The Apples to Apples card game is interactive, funny, and addictive. The rules are simple, so there are no barriers to who can enjoy this great card game. 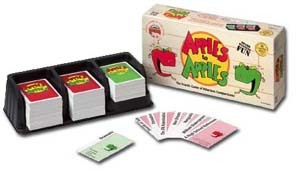 Apples to Apples® is the wild, award-winning card and party game that provides instant fun for four to ten players! It's as easy as comparing "apples to apples" ... just open the box, deal the cards, and you're ready to play! Select the card from your hand that you think is best described by a card played by the judge. If the judge picks your card, you win that round. And everyone gets a chance to be the judge! Each round is filled with surprising and outrageous comparisons from a wide range of people, places, things and events. Fast moving and refreshing, Apples to Apples® is perfect for any get-together with family and friends!